when it was founded by their ancestors, seven generations ago. Through the centuries, the farm's motto has been "Looking Forward Since 1806", a phrase that helps them make decisions on a day to day basis. The farm became primarily a dairy farm in the 1920s and had a fair amount of success until the milk market crashed in the early 2000s. The Barstow's were faced with a choice, get out of agriculture, or diversify. 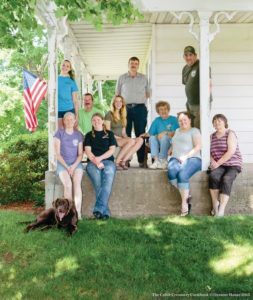 Based on the dream of Shannon Barstow's love of baking, the family opened Barstow's Dairy Store and Bakery in 2008. Since then, the family has installed Barstow's Anaerobic Digester in 2013 and began using robotic milkers in 2014. Their commitment to their community, land, animals, and planet continue - as always - forward. 1806 - Septimus acquired property in Hadley and moved from Canterbury, CT with his family. The farm primarily grew tobacco, broom corn, and, of course, Hadley asparagus. 1847 - Elias, Orelia, Harriet, Olive, and Susanna Barstow, sold their interest in the small crop farm to their brother Luther Barstow. 1870s – Third generation John and Asaph Barstow, sons of Luther, take over the family farm. John was also a selectman of Hadley from 1901 to 1909 and a trustee of Hopkins Academy. 1910s – Luther Barstow, fourth generation and only son of John, takes over the family farm. He served as deacon of the First Congregational Church, and was a trustee of Hopkins Academy. 1920s – Barstow’s Longview Farm became primarily a dairy farm. 1932 - Manual milkers replace hand milking on the farm. Nelson Barstow was 13 years old. March 1936 – largest flood in the history of the established farm inundates farmland and Hockanum Village. 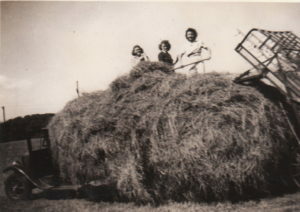 1940s – John and Nelson Barstow, sons of Luther, take on the family farm as fifth generation. 1980s – Steven and David Barstow, sons of Nelson, take over the family farm as the sixth generation. 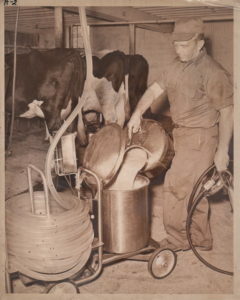 1984 - Milking parlor replaces manual bucket milkers. 1990s – Shannon Barstow spends many afternoons with Grandma Marjorie Shipman Barstow in the farmhouse kitchen learning how to make pies, cookies, donuts, desserts, and dinners with family recipes. 2000s – The world milk market takes a tumble. June 30, 2008 – Barstow’s Dairy Store and Bakery opens its doors to the public. July 21, 2012 – Barstow’s Dairy Store and Bakery hosts their first annual Burger Fest. December 31, 2013 – Barstow’s Anaerobic Digester first begins creating green electricity from a combination of cow manure and food waste. 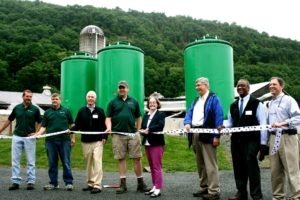 June 2014 – Ribbon cutting event for the Barstow’s Anaerobic Digester. 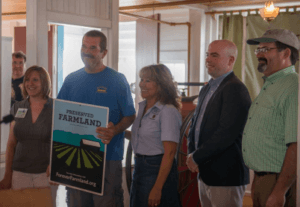 August 2014 – Barstow’s sells the development rights to 123 acres of their land under the Agricultural Preservation Restriction ensuring their land will remain farmed and open. The capital was reinvested into the farm to purchase robot milkers. October 1, 2014 - Massachusetts bans food organics from entering the waste stream. December 2014 – Four newly installed robotic milkers replace the old manual milking parlor. January 2015 - Steven Barstow II, son of Steven Barstow, becomes seventh generation farm partner to Barstow's Longview Farm, Inc.
May 2016 - Cabot Creamery Cooperative wins the 2016 U.S. Dairy Sustainability Award for Real Farm Power TM in connection with Barstow’s Anaerobic Digester. March 2017 – Fifth robotic milker is installed to accommodate a growing herd. 2018 - Barstow's Dairy Store and Bakery celebrates 10 years in the restaurant business.